It is with great sadness that the family of Harold John Grasby announces his passing at the Grandview Personal Care Home on March 29th, 2018 at the age of 94. Harold was born in Grandview, Manitoba on December 28, 1923 to Robert and Mabel Grasby (nee Barnett). He had two sisters Ruth and Evelyn, a twin brother Howard and a younger brother Donald. Harold grew up on the family farm and attended the Ottawa School. His father needing help on the farm, so he cut his education short to help out and later continued to run the family farm with his brother Don until 1995. Harold later retired to the town of Grandview in 1997. 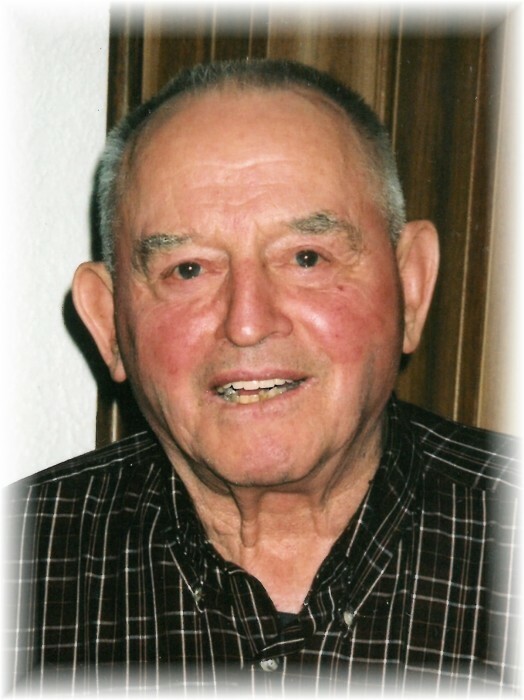 Harold’s life for the most part was filled with the love of farming. He would get up at the crack of dawn to tend to the livestock and then carried on with everything else that was involved in a mixed farming operation. There were many long days during seeding and harvest, taking cattle to pasture or keeping an eye on the cows about to calve. Attending local farm auctions or taking drives in the country with the neighbors were a great time to kick back and sometimes the day would end with a supper cooked by Harold. For entertainment he took up the sport of curling and when no longer able to curl, he continued to volunteer his time by working at the bar during the many bonspiels held over the winter. He would also make a weekly trip to town Saturday evenings to catch up with friends and 20 years ago he joined the local Legion as an associate member where he had many great evenings. During Christmas he would most often travel to Winnipeg and then a few years later to Calgary to share the holiday with his two sisters and nieces and nephews. He also became a very good cook making the best shortbread and nanaimo bars of anyone. He would faithfully donate a sour cream raisin pie to be auctioned at the Grandview Legion Head Cheese contest, and when his niece Karen and Bob would come for a visit it was nothing to throw together a chicken dinner with all the trimmings. There might even have been a rhubarb crunch dessert, which was his favorite. Upon retiring to the town of Grandview he started a special relationship with Sarah Green and together they went on many adventures including a trip to Vegas, trips to Sarah’s cabin at Granite Lake, drives to Yorkton to attend the casino or go out for supper. They took in all the activities at the local Legion, and simply enjoyed time taking drives in the country, going out for supper with friends or having friends in. In 2016 Harold became a resident of the Grandview Personal Care Home and spoke very highly of the excellent care he received. Although a sensitive man, he enjoyed their teasing and apparently could bounce back with a quick one liner. Harold was predeceased by his parents, his two sisters, his two brothers, his nephew Keith (McComb) and his wife Heather, and companion Sarah Green. Those Harold leaves to cherish his memory are his niece Karen (Bob) Brown of Calgary, nephew Rob (Nancy) Grasby of St. Albert, niece Anne (Mitch) Donaldson of Marathon, niece Debbie (Jim) Winfield of Grandview, niece Deneen (Grant) Fisher of Grandview, sister-in-law Donna Grasby of Grandview, several great nieces and nephews, and extended family and friends. If friends so desire, donations in memory of Harold may be made to the Grandview Personal Care Home. Funeral Service was held on Thursday, April 5, 2018 at 2:00 pm from Grandview United Church in Grandview, MB with Rev. Karen Kuzek officiating. Interment took place in Grandview Memorial Gardens & District Cemetery in Grandview, MB.